This car is a Mercedes-Benz GLK350 4matic compact SUV. Thus limited space is available. Additionally, the wife mandate is to keep the car free from wires and radio mess! ….and not becoming a porcupine. The goal, however, to provide a flexible radio setup for my normal DMR & Analog communication of both UHF and VHF. I have normal scan, but not dual simultaneous receive capability. This is OK for daily use. The radio has 250 sixteen channel zones (more channels per zone would be convenient) and the channel layout is by geographic area and function. This simple, yet capable radio covers 90+% of my daily need. For a special or public service event I add radios to meet the need. Power is supplied from the car’s main charging cable for the emergency brake battery (yes, MB uses a emergency battery for the brake brain), prior to the charge controller. 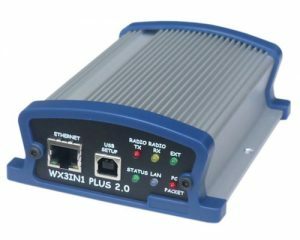 WX3in1 APRS TNC I-Gate and smart beacon with custom firmware. All power distribution cables have Anderson PowerPoles. A power switch is turning off power to Comm Radios 15 minutes after the alternator stops charging. PowerPole distribution block is located in the Electronics Rack and by the passenger seat. A PowerWerx 12v to USB converter is located by the from passenger seat for charging of iPhone or iPad. This unit is found to be RF noise free. A 2nd is located in the Avionics Bay to power the HotSpot. The Router, WX3in1 and DMR Hotspot remains powered at all times (for now). About 17a/hr is consumed in a 24 hour period. However, the car battery is recharged while driving to and from work. Connect Systems CS800D dual band DMR/Analog radio (remote head). Kind of a commercial radio look and feel. Size is medium, however remote mounted. Screen is small with minimal information. Although the car has a factory GPS, an iPad with window mount provides APRS and/or live maps above the radio. 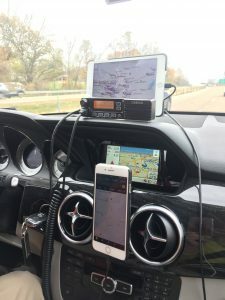 iPhone integrated with car’s audio is held my magnetic mount. Looking for a better picture to show the simple clean look. 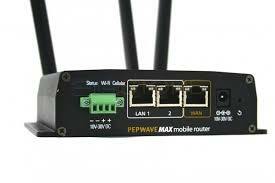 A Pepwave MAX BR1 serves as the onboard LAN & WAN Router. The LAN has 3 Ethernet Ports (I prefer ethernet over WiFi if possible). A MOXY mobile switch is in the system, but I am combatting RFI. This it is currently deactivated. The WAN/Internet is supplied from Verizon LTE/4G by the Pepwave unit. When close to the usual places the Pepwave will attempt to use WiFi access for internet to save Verizon usage. This docket mode also allows me to perform remote login from the house to work on the computer systems. I used to have a Allinco DR135 APRS beacon in my car. Between digi coverage and the need for yet another exterior antenna, I am much happier beaconing into -IS directly. APRS position is beaconed out of -IS via cell data. 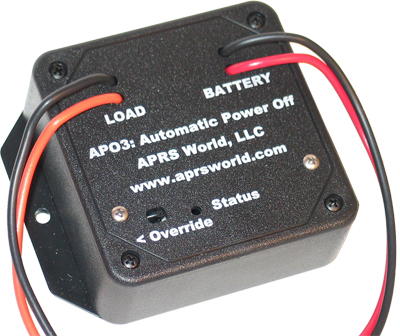 APRS position can be beaconed through the Allinco D1200 at 25W. The smart TNC is a MICROSAT WX3in1. 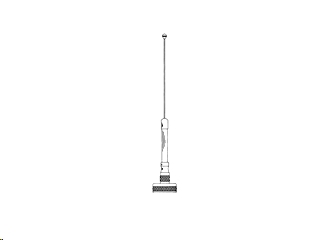 3″ knob antenna. Huge performance improvement over a cellphone. NMO. Austin 500 2m/70cm 18″. NMO. After 15 years, my original Austin antenna finally broke in half. Replaced. 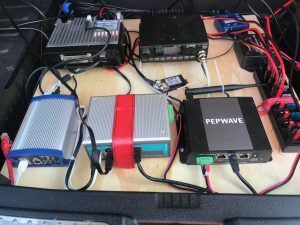 During a Public Service Event where more simultaneous monitoring is required, a Yaesu FT8900 is placed on top of the dash on a non-skid rubber mat. A mini-iPad with suction cup window holder is also added. This provides a total of 3 VHF/UHF analog transceivers and a DMR/ANALOG VHF/UHF option. There are times I miss the DMR roaming feature in the Motorola and Hytera high end radios. It is fascinating to drive through a state and switch repeaters while maintaining a conversation on the same talkgroup automatically. However, since 95% of my DMR is via my onboard hotspot i cannot justify the extra realestate in my car for an additional Moto or Hytera radio. 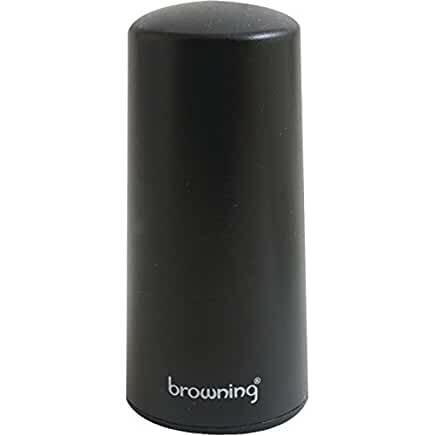 Always on the lookout for a CS800D type radio with roaming feature.